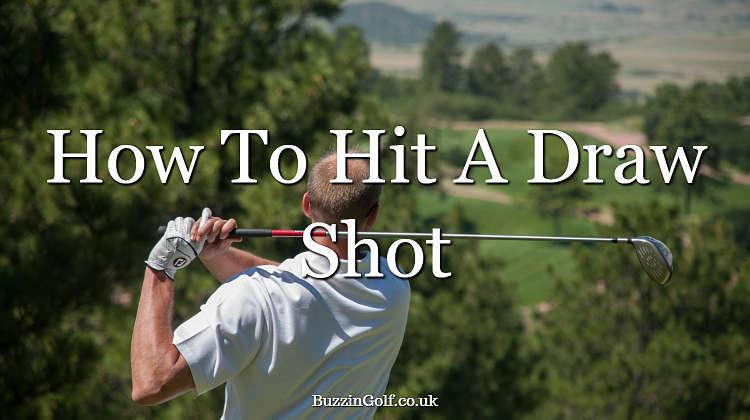 Have you ever wondered how to hit a draw shot in golf? Here’s the answer, including some great drills you can use to master the draw. Consistency is the name of the game in golf. If you want to start raking in some lower scores, you are going to need to get a rough idea of what to expect when you step up to the tee. It is for this reason that the game’s elite players work on developing their shot patterns. A shot pattern simply refers to the flight path that your ball takes. If your shots stray to the right, it is called a fade. If they stray to the left, it is called a draw. Players just starting out often struggle with shots that move too much to the right, or too much to the left (slices and hooks, respectively), but if you are able to control the way that you move the ball, it can go a long way towards improving your game. Today we will be taking a look at how to work the ball to the left. Read on for a guide on how to hit a draw! If you are still scratching your head wondering why you would even want to intentionally make the ball do anything other than go perfectly straight, allow me to clarify: a straight shot is great, but also isn’t something you can expect to do every time. Establishing a consistent shot pattern will help you eliminate an entire side of the course. If you know that you hit a nice reliable draw every time, and your miss is a hook, you don’t need to even think about the right side of the course at all. You can aim your shots with confidence knowing that your ball is going to draw to the left. Some situations are also simply going to favor a draw ball flight. For example, when the pin is tucked to the left side of the green, you can confidently aim for the center of the green knowing that if you hit a straight shot, you will be on and in good shape, and if your customary draw starts working its magic, you will be in even better shape. Reliability aside, incorporating a draw into your swing is also a simple way to pick up a few extra yards. Draws tend to go longer than fades, or even the straight ball because they use a lot of forward spin, which means that the ball is going to roll out a lot longer when it lands. Now that you understand the benefits of working a draw into your swing, let’s get to work! There is a common misconception that swing plane determines the path that a ball takes. A flatter swing plane will yield a draw, while an upright swing plane yields a fade. This simply isn’t true. Swings with a flatter swing plane may tend to produce more draws, but what really matters is the way the clubhead moves through the ball at impact. For what it is worth, flattening your swing is one way to promote a left moving flight pattern but it can also be an overly complicated and ultimately unnecessary process to change entirely change the way that you swing the club. And of course, even if you do go through all that work, you still may end up with the same slice you’ve always had. To hit a draw shot, you need to start swinging out just right of the target line with a clubface that is slightly closed. This will get the ball started on the right, and curving gently back to your target. If you are having trouble imagining what that looks like, or how to get it that’s ok. What’s important is that you are able to do it. Amateurs are often stifled by overly complicated descriptions of mechanics when in reality what they really need are a few good drills. That’s exactly what we will be looking at next. Hitting golf balls with your feet together is one of golf’s most basic but classic drills. To perform this drill, you stand with your feet together, and the ball in the middle of your stance. Once you are in position, you are simply going to try your best to hit balls the way that you normally would. Hitting the ball with your feet together forces your arms to adopt a path that naturally promotes a draw. It’s a simple way to alter the path of your clubhead without over thinking your swing plane. Keeping your left foot a little bit more forward at address is a simple and effective way to promote a draw. To perform this, you will simply set up to the ball with your right foot a little bit back of your left foot. Technically speaking, this may be more of a tip then it is a drill, as this is something that you can also bring to the course if you are in a tight spot and need to make sure you are able to hit a draw. Like the feet together drill, dropping your right foot back a little bit is simply going to promote a clubhead path that favors a draw. If there is any draw back, it is that this approach does force you to stray from conventional set up. If a draw is to be a permanent fixture of your swing, you may want to work on being able to hit it even with a traditional stance. While bringing the right foot back is a great way to practice, you should strive towards not needing to depend on it to hit your draw. Generally speaking, you want your body to coil and uncoil during your swing. The coil is where you are going to get most of your power, after all, which makes it a necessity on the course. For the purposes of this drill, however, you will want to do your best to eliminate it. The name pretty much says it all. Next time you go to the range, set up to the ball the same way that you usually do, but this time hit a few shots while only allowing your arms to move. The effect here is basically the same as that of the keeping your feet together while you hit. When you eliminate the body from the swing you are able to allow the arms to move in a way that naturally favors a draw. What I like about this variation is that it allows you to get in the habit of addressing the ball the way you normally would on the course. If you would like, you can experiment with gradually adding a little bit more coil to this drill each time until you build up to your regular swing. With practice, this may help you transition into a natural draw. This next drill is simple but effective. In order to perform you are going to need to bring a shoebox with you for your next trip to the range. It is a little bit awkward, yes, but there is no need to be embarrassed especially when it helps you start hitting killer draws. Simply set up to the ball the way that you usually would, but with the shoe box placed just outside the ball, by where the toe of your club rests at address. Once you have done this, hit balls while trying not to graze the box. The placement of the shoebox will train you to naturally bring the clubhead through the ball in a way that promotes a draw. I like this drill for how simple it is. It allows you to practice drawing the ball without changing up your swing or stance, which also makes it easier to transition your new draw to the course. Now that we have established a few drills that you can perform on the range, here is a short list of quick tips that will further help you get your draw. A little bit more distance between yourself and the ball will naturally promote the inside swing path that we have been talking about throughout this guide. I mentioned earlier that you don’t have to flatten your swing to achieve a draw and that is the absolute truth. Still, if you want to flatten your swing anyway, you may find that it helps. Flat swing planes are a little bit trendy right now anyway. Pros like Matt Kuchar, Ricky Fowler, and Zach Johnson have all found a lot of success with theirs, and as a result it is a swing habit that many amateurs seem to be adopting as well. If you would like to flatten your swing, there are a lot of drills you can try, but a simple one is to focus on swinging back so that the shaft of your club is parallel to your right shoulder and then through so that it is parallel with your left shoulder. Again, the flatter swing plane may or may not produce a draw but if you want to experiment with it, it is something worth trying. Swinging smooth is a tip that applies to basically every facet of the game. You simply aren’t going to get anywhere with an abrupt, choppy swing. In this case, a nice, smooth swing will give your arms the time that they need to release through the ball, which is a necessary component of hitting a good draw. The process for hitting a draw is the same with every club. That said, shorter clubs with more loft are harder to hit a draw (or fade, for that matter) with. Conversely, longer clubs, like your woods and driver, are much easier to hit a draw with. That being the case, you will want to apply these tips and drills a little bit more delicately with the driver than you do with the wedges to avoid the dreaded snap hook. As you practice you will naturally get a feel for what you need to do for the driver versus the wedge. Remember, practice makes perfect. The tips on how to hit a draw shot listed above will help you, but only if you take them to the range and put in some hard work. No one ever said that golf was easy. For what it is worth, if you do put in the work, I think you will be glad that you did. Done properly, a draw will add distance and consistency to your game – two things that most players are pretty desperate for. If you want to get great off the tee, and hit more greens, you know what to do. Start working on your beautiful new draw today!